The human eye  is a remarkable organ. Like a camera, the eye is able to refract light and produce a focused image. This image is recorded, processed and transmitted to the brain. In fact, almost every aspect of the modern camera can be traced back to a feature in the human eye. The eye is essentially a ball (the eyeball) filled with a water-like fluid. In the front of the ball is a transparent cover known as the cornea. The cornea has the dual purpose of protecting the eye and refracting light as it enters the eye. After light passes through the cornea, a portion of it passes through an opening (aperture) known as the pupil. A diaphragm, called iris (the colored part of the eye), can enlarge the pupil in low-light conditions to let in more light or reduce it in very bright conditions to let in less light. Light that passes through the pupil enters the eye's imaging lens, which is made of a transparent fibrous material. Unlike most camera lenses, the eye's lens is able to change its shape. This property of the lens is used for focusing. The lens squishes (gets more curved) when we look at very close objects and relaxes (gets flatter) when we look at distant objects. 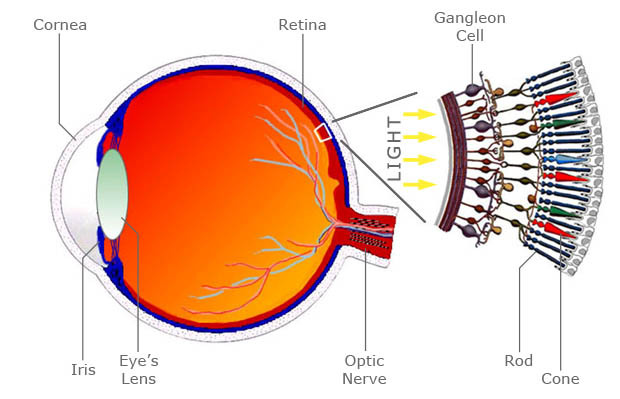 The inner surface of the eye on which the image is focused is known as the retina. 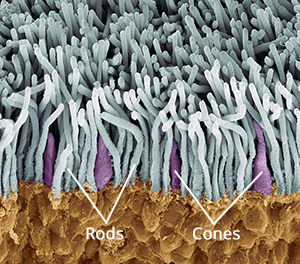 The retina contains two types of light sensing cells − rods and cones. The rods detect the brightness of the image formed on them and the cones sense the color. They send the detected brightness and color information as nerve impulses to the brain via the optic nerve. The brain, upon receiving these impulses, interprets them as images. As we can see, the similarities between a modern camera and the human eye are striking. The camera is not just inspired by the eye, it actually imitates it closely. The camera's lens is like the eye's lens and cornea, the aperture of a camera lens is akin to the iris, the image sensor plays the role of the retina and the pixels are like rods and cones. "Anatomy of human eye and retina," [Online image]. Available: http://webvision.umh.es/webvision/sretina.html. [Accessed: Oct 4, 2009].